One word describes this dish - AWESOME! You can definitely use the frozen, cooked shrimp - another time saver. After thawing the shrimp, rinse and place on paper towels to pat dry. This makes the difference in having the batter stick to the shrimp. 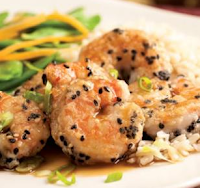 In reading the other reviews on this recipe, I also learned that you need to make sure to place each shrimp in the skillet WITHOUT crowding them together otherwise they will stick together. If your skillet is ready, as soon as you place each shrimp in, you will see the coating start to puff. Definitely wait the 1-2 minutes and then you can turn each one without any problems. Only because I happen to have just enough dry sherry for this recipe did I use it. Otherwise, next time going to use sugar-free Cranberry juice along with the orange juice. By decreasing the orange juice to 1/2 cup, we went from 5.3g of sugar to 4.0g. If you are making this for two [I used a total of 16 shrimp], this recipe cooks up really quickly. So if serving with rice, make sure to start it first otherwise your shrimp will be done before your rice.